Crock-Pot Catalina RoastIn a bowl, mix the two bottles of Catalina dressing and the packet of onion soup. Once mixed, pour half of the mixture in the crock pot then place the roast in. The pour the remaining dressing mixture atop the roast. Beef Ravioli SoupAs the days grow cooler, this hearty soup can be the center of a great meal. Amish Apple PieMix the apples and ingredients in top list together. Pour into 10 inch pan. Bake 20 minutes at 350 degrees F. While that is baking, mix the sugar, brown sugar and cold butter together. Toasted PecansMix all in large bowl, spread on cookie sheet and roast for 25 minutes, stirring twice. Whole Wheat Sandwich BunsCombine first 5 ingredients in saucepan. Heat to warm. stir together 4 cups flour and yeast in bowl. Add warm liquid and eggs. Beat at low speed of electric mixer 1/2 minute, scraping sides and bottom of bowl constantly. Cooked Fudge FrostingMix all ingredients, except vanilla. bring to a boil over medium heat. Stir twice. Boil 1 minute; set aside. Do not stir! Cool to lukewarm. Beat like fudge. If it becomes to thick, put a little milk in to thin down. Easy Ground Meat, Mushroom and Noodle CasseroleShred cheddar cheese and set aside, or purchase shredded cheese at market. Macaroni Tomato CasseroleCook macaroni in salted water until tender. Add all ingredients together. Place in casserole. Cover top with bacon slices. Bake at 350 degrees F for about 1 hour. How to Make a Plastic Bag Storage ContainerTake a piece of fabric, fold it over and sew side. Hem each end leaving space for the draw string. Run a draw string at the top with a string to hang the container on a nail. Run elastic around the bottom and pull together. 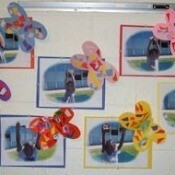 Picture MeThis is an easy craft for kids of all ages and something we just did with the kindergarten class that I volunteer in. It does not take much time but makes a beautiful gift for parents, grandparents or someone special. This craft can be done anytime of the year. 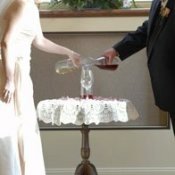 Use Wine As a Sign of Wedding UnityInstead of a unity candle, my son had a wine ceremony. Carafes of red wine and white wine were poured into an empty carafe, then the mixture was poured into a goblet from which they both drank. Stock Up on OTC MedicationsTime to stock up on OTC (over the counter) medications for flu season. Nothing's worse than being sick and having to go out to the store for these things you will probably need anyway before the years end, other than running out of TP and having to be the one to go buy it. Give Angel Food As A GiftThere is a great web site called AngelFoodMinistries.com. There are no special requirements to take advantage of this site, and they have phenomenal food deals. For example, a single package costs $30 to purchase and the contents you receive have a value of between $75 - 80. Collect Shower Water For PlantsI use a 4 quart ice cream pail to catch the cool water while waiting for the water to get hot to take my shower. I usually have a full pail and use this water to water my plants. 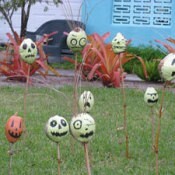 Halloween Yard DecorationsDrill large hole in bottom of coconut (or gourd) and drain out any liquid. Paint half the coconut/gourd with a base coat of any color paint. Let dry and then paint on the faces in black. Photo: Shadows Relaxing On VacationRelaxing on a family vacation. Chloe (Pekapom)Chloe is 2.5 years old. 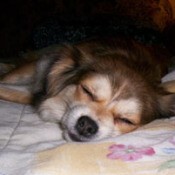 She is a Pekapom (half Pekingese, half Pomeranian). I had just started dating a new girlfriend, and one night we went to a place that was kind of like a farmers market/flea market. In the parking lot on our way in a lady approached us with this 6 week old darling puppy and we couldn't say no. I am no longer dating the woman but we are best of friends and jokingly, share custody of "our little girl", Chloe. American Dagger Moths Can Be ToxicBeware of hairy yellow caterpillars with black spikes. They are American dagger moths that have have toxic properties when hairs are touched. One slight brush sent me to the ER with significant hives, elevated blood pressure, facial flushing, and chills. Weddings Are Too Expensive for Just One DayMy fiancee and I had been together for a year when I asked him why he had not proposed. His reply was that, "Weddings are too expensive for just one day". Ahh, true love. Because neither of us came from money, we did not have to worry about the whole thing getting out of hand. Use a 2 Liter Bottle to Store BirdseedI have just discovered how easy it is to fill my outdoor bird feeder by pouring it out of a large plastic 2 liter soft drink bottle. Use Your Pet as a Halloween PropThis year we got a puppy so he'll be going trick or treating with our 12 year old daughter. Good opportunity for puppy to meet all the neighbors. Our daughter is going dressed up as a football player and the puppy will be her football! Collecting Sun Flower SeedsCan you still use the seeds from a sun flower if you take the seeds out of the flower before they dry or change color? PVC Flag PoleI am trying to make a flag pole out of PVC pipe that goes in the ground. The top is at about a 45 degree angle, and it turns in the wind. Does anyone have instructions on how to make one of these flag poles? Help! Sponge Candy RecipeLooking for recipe for a candy, which was sponge like and the size of a 1 pd. loaf of butter, yellow in color, and melted in your mouth. 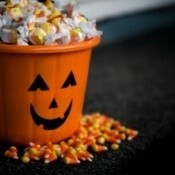 Checked many stores that have the old fashioned candy, but to no avail. I've made the sponge candy but it's not the same, very hard. I wish I had an image to show you. This was way back in the 40's and 50's. Meals For A Freezer SwapI am going to a freezer swap on Friday. I am looking for easy, cheap, relatively healthy meals that can be frozen, and then shared with friends. Thanks in advance! Personalized Photo Albums For GrandchildrenI am looking for a simple (quick and inexpensive) project to make as Christmas gifts for my 12 grandchildren, ages 5 to 23. I am wanting to do something with the digital pictures that I have of them from over the last few years. Natural Shower Tile Spray RecipeDoes anyone know of a natural shower spray? Although I know it works, I don't want to use bleach because it is a poison. I am trying to eliminate all such cleaning products from my home. Using Less Baggies For Packed MealsMy husband and I pack lunches and snacks every day (sometimes dinner too) using plastic containers and 4-5 baggies per day. I want to cut down on the amount of baggies, yet don't want to use numerous additional plastic containers. Bringing Food Instead of Gifts to a ReceptionI am getting married on April 18, 2009. We both have large families coming from out of town, so we are looking at a sit down reception with over 150 guests; and that's not including very many friends. "People" are more important to my fiance and I than gifts, so we want to have as many as we can at our reception. Homemade Vinyl Floor CleanerWhat is a good homemade recipe for Vinyl floor cleaner? Temporary Shelves Using Cinder BlocksIs there such a thing as removable or temporary shelves? I live in a apt that has only 2 shelves per small closet. I heard you can make temporary shelves out of cinder blocks, I have not idea how to do this. Game Ideas for a Church Halloween PartyI am responsible for our Church Halloween party for children up to age 18 and I need ideas for games etc. We already have the food and snacks that we need. Any ideas would be helpful. Thanks! Homemade Ketchup Came Out WateryI made the following recipe for ketchup and it came out too thin/watery. What can I add to thicken it? The only thing I did different was that I used 1 TB of tomato sauce instead of 2 heaped TB of tomato puree. Lions Vs. Bulldogs Homecoming DecorationsWe are the Bulldogs and are playing a Lion team for homecoming. Any decorating ideas?